Judith Liddell and co-author Barbara Hussey bring a love of bird watching and years of experience trekking through the Land of Enchantment to their two well-researched birding guides published by Texas A&M University Press. 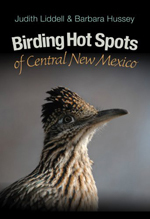 Their first book, Birding Hot Spots of Central New Mexico (2011), covers the Rio Grande corridor, Sandia and Manzano Mountains, Petroglyph National Monument, and the preserved areas and wetlands south of Albuquerque. 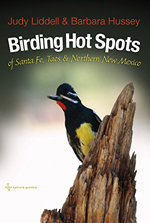 Birding Hot Spots of Santa Fe, Taos, and Northern New Mexico (2014) is their second guide which focuses on 32 sites not covered in the first book. You’ll find Judy on her websites at JudysJottings.com and WingAndSong.com. What unique challenges did you face while writing Birding Hot Spots of Santa Fe, Taos, and Northern New Mexico? It was extremely important that we assured the accuracy of all information about each birding site in the book. Our readers have appreciated our attention to detail and reviewers have commented on how well researched the guide is. Another challenge was finding local birders who could review what we had written to make sure it matched their experiences. The positive outcome was that in developing these relationships, many have become good friends. You co-authored the book with Barbara Hussey. What was that experience like? How did you divide the duties of writing the book? Before we started writing, we had a strong friendship that valued each other’s talents and strong points. As we discussed the division of labor, it was fairly easy to decide what each of us would do. I had been writing before we started, so it was natural for me to assume the task of writing the copy. Barbara is a detail person and an excellent proofreader. I would write a section, put it in DropBox for her to review, and she suggested changes in language or sentence structure. Barbara took on the responsibility for writing the directions to each site and making the rough draft drawings of the maps. In addition to having a wealth of information about bird species, Barbara has a strong interest in geology which enabled her to add relevant information about the habitat and natural history. We visited each site several times together which facilitated our decisions about what information to include. We used this formula successfully for both books and are still fast friends. Tell us how the book came together. How did you know it was done and ready for the editor/publisher? When we were writing Birding Hot Spots of Central New Mexico and deciding whether to include the area around Cochiti Lake, we laughed and said, “We’ll save that for the next book,” never dreaming there would be a second one. As soon as the first book was published at the end of October 2011, people began asking us when we were going to write another book. We sent a proposal to the publisher in December of that year to determine their interest. The editor gave us the green light early in 2012 and sent us a contract. It took two years to research, write and edit the manuscript. Since we used the same successful format as our first book, we knew it was finished when we had all the required information for each part of the book and were within the page limit of our contract. What makes this birding guide different from similar books on the shelf? Our birding guides are the only ones written by women—and the only ones that include information about restroom availability. In addition, our guides are useful to a wide variety of outdoor recreation enthusiasts. A friend who is a fisherman bought our guide because it provides him information about fishing sites, as well as lets him appreciate the bird life he observes while fishing. It was important to us to help birding enthusiasts understand the relationship between the birds they see and the habitat where they are found. This information in most guides is not tied together. What did you learn from writing your first book, Birding Hot Spots of Central New Mexico, that you applied to the newest guide? Based on the way we ended up organizing the information about each site for the first book, we were able to devise a template that we took with us when we visited the sites for the second book. This enabled us to make sure we gathered all relevant information. This was extremely important because if we had to return to a site when we were in the final process of editing to secure missing information, it would have required a lot of time and travel. We also realized we needed more maps than we had included in the first book. I’m sure you discovered many interesting facts while doing research for your guidebooks. What one or two things stand out in your mind? I was fascinated by the historical information I learned while researching each site. For instance, there is a branch of the Old Spanish Trail that runs along the south side of the Rio Chama downstream from Abiquiu Dam. We tried to include this type of information in the overall description of a site. Two of the sites are located on Pueblo lands. We met with staff from the Natural Resources Departments of both Cochiti and Ohkay Owingeh Pueblos to appreciate their perspectives and reflect their wishes about how visitors should visit. Do you have your own favorite birding hotspots? In Central New Mexico—Ojito de Padua Open Space and, of course, Bosque del Apache. In Northern New Mexico—Valles Caldera National Preserve and the Cochiti Lake area. What is the best compliment you’ve received as an author? What encouragement or advice has helped you the most on your writing journey? While I have written on and off my entire life, I knew I wanted to devote serious time to writing during my retirement. I stumbled on SouthWest Writers about three years before I retired and attended a meeting. When those at my table asked what kind of writing I did, I responded that at the time it was primarily technical writing related to my job, but I wanted to write more descriptively. Someone suggested I write every day. When I protested that I couldn’t do that while I was still working, the fellow writer suggested I write every week. I took the challenge and wrote about an interesting experience each week. To make sure I didn’t slack, I emailed my writing to a group of friends and family and asked them to provide feedback. My brother-in-law meticulously read each one and offered feedback, both positive and negative. Any new writing projects you’d like to tell us about? I am writing family history and memoir stories that will eventually be put into a book for my children, grandchildren, and nieces. KL Wagoner (writing as Cate Macabe) is the author of This New Mountain: a memoir of AJ Jackson, private investigator, repossessor, and grandmother. 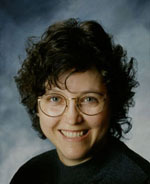 Kathy has a new speculative fiction blog at klwagoner.com and writes about memoir at ThisNewMountain.com.